The history of rotator cuff repair is a history of transitions – from open to mini-open to arthroscopy, for example, and from single-row to double-row to transosseous equivalent repair. Is anchored to anchorless repair the next logical transition? That depends on who’s answering the question. 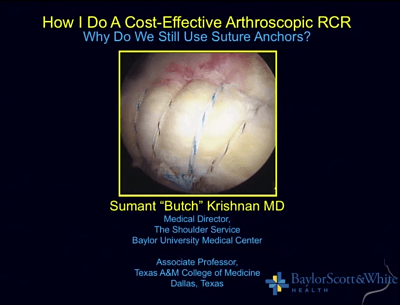 At ICJR’s 6th Annual Shoulder Course in Las Vegas, Bradford O. Parsons, MD, and Sumant “Butch” Krishnan, MD, debated the issue of anchors versus anchorless repair, with Dr. Parsons advocating the use anchors and Dr. Krishnan supporting anchorless repair. Both surgeons agreed that in the increasingly cost-conscious healthcare environment, anchorless repair represents the less-expensive option. But cost isn’t the only consideration, Dr. Parsons said: Surgeons should perform the type of repair that they’re comfortable with and that matches their skill set, regardless of cost. For him, that means a double-row repair with a suture bridge construct. 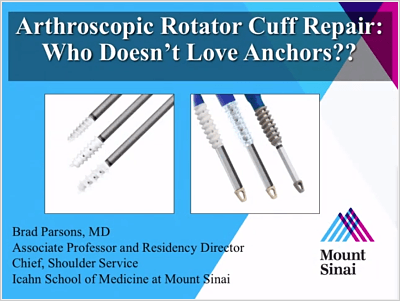 He also believes anchors are essential for patients with subscapularis tears, soft bone, or massive rotator cuff tears. Dr. Parsons and Dr. Krishnan acknowledged that the 2 techniques result in equivalent clinical outcomes. So why does Dr. Krishnan prefer an anchorless technique? He takes issue with the significant bone damage that can occur with anchors. With the anchorless technique he developed, the bone itself anchors the cuff, rather than placing an actual anchor implant through the bone. Click the images below to watch both sides of the debate. Dr. Parsons has disclosed that he is a consultant for Arthrex. Dr. Krishnan has disclosed that he receives royalties from and is a paid consultant for Wright Medical Technology and that he receives royalties from TAG Medical. Next articleWhy Do Some Recreational Runners Develop Overuse Injuries?